Distilled in Fougerolles, France. It's a light green yellowish color, and it smells just wonderful. 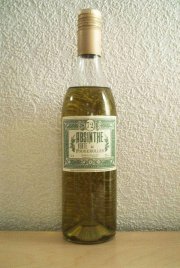 When smelling it neat from the glass, one can immediately scent the complexity of this absinthe. Of course it's quite hot from the 72% alcohol, but that is somehow overpowered by the blend of herbs. Tasting it neat was actually a pure pleasure, it was really tasty and could easily be consumed as a digestif - neat. But, adding water to it reveals all the notes, all the various flavours of the mixture and produces a light greenish louche. This one beats all the other absinthe vertes I've had, apart from the vintage CF Berger - ofcourse. Again, thanks to Peter from Liqueurs de France, I got to sample a prototype of the Verte de Fougerolles which was rejected, and instead the now available composition was chosen for commercialization, and I can understand why. The prototype I got to sample had a lot more anise in it. It produced a thicker louche, but the anise was to overwhelming. Although it was very good, the final product is much more complex and tastier. If I should compare the Verte de Fougerolles to any other I've tried, It'd have to be the Un Emile 68. This one is much smoother and even though it's at a higher alcohol level, it doesn't have that alcohol heat. As a side note I can say that the louche of this one was very close and similar to the one of the vintage 1910 C.F Berger. Lovely. Among the vertes, this is the number one of the commercially available ones. A couple of days ago I finally got around to open the bottle I've got with the "new" Verte de Fougerolles. A slightly modified batch from the first one. With a little more anise and completely unfiltered it presents a little more bite in the taste, without being to heavy on the anise. The anise also helps producing a thicker louche than the "old" version. Skipping the filtration process adds quite a bit to the taste. It's still the top verte!